Custom Dog Collar handmade in California! Adorable Easter dog collar! 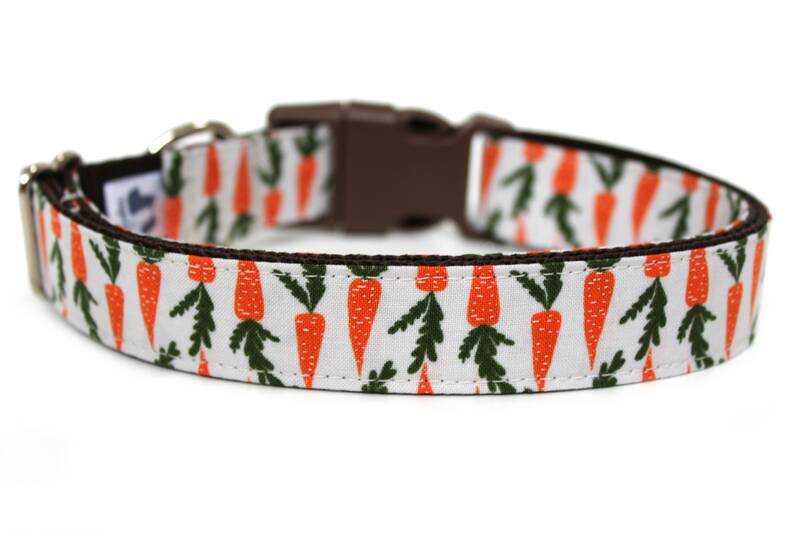 This spring dog collar is made with brown nylon webbing, a matching brown side release buckle, and little carrots all over! Perfect for boy or girl dogs all spring long. Please indicate which size you would like...note that all sizes on this spring dog collar have 1" hardware. Add a note in checkout your dogs size. So cute! The bunny survived a long fun weekend. I unfortunately didn’t think to take pictures until after she rolled in the mud. This picture doesn’t do it justice. I've ordered from this seller multiple times and every time it's been great workmanship and a smooth transaction. This collar is super cute and I actually think it's cuter in person than in the pictures. The shipping took a little bit longer than usual, but still fit the timeframe stated in their policies. My pup wasn't too pleased about being woken up from her nap by my camera flash, but she still loves her new collar. Thank you! I try to describe all my items as best as I can and try to take accurate photos as well. Everything is handmade and variation will occur. I would like everything to be a final sale but I am more than willing to work something out if there is a problem with your order! Please choose the correct size for your dog and feel free to contact me if you are not sure what size is best; I am happy to help! **Returns and exchanges: the product must be unused and unwashed in brand new condition in order to exchange or return. Custom ID tags cannot be exchanged or returned -- if you purchase a collar with a custom ID tag, I can only return/exchange the collar but not the tag due to the nature of the product. If you need to return/exchange a product, I do ask that you pay for shipping costs for the return/exchange. Current processing time is 2 weeks - This does not include shipping. Shipping within the US takes 2-5 days and Canada takes anywhere from 1-2 weeks! I ship via USPS First Class mail with Delivery Conformation. If you need a different shipping service I am happy to accommodate but please contact me prior to purchasing. Each collar and accessory will arrive with a care card with instructions for cleaning :) Please contact me if you have any questions! Collars Widths: Please see each individual listing for the width of that particular design. Collar lengths: Please see each individual listing for the lengths available in that particular designs. Each item is wrapped nicely up by me with care instructions and perfect for gift giving. If you would like a personalized note, please contact me with the details.